Our smartphones are with us all the time, but they say almost nothing about our personality. While you can personalize the back of your device with a case, the front has traditionally been reserved for blank, boring screen protectors. Enamore Products developed a patented process that’s changed all that. Now, with Screenflair, you can personalize your protection with unique graphics and artwork that go around, and even on, your screen. They have a transparent quality that mostly fades to the background when the screen is on, adding a unique accent to your favorite apps and websites. Each protector is custom-fitted to the specific smartphone model and uses an adhesive that won’t leave behind residue after it’s removed. 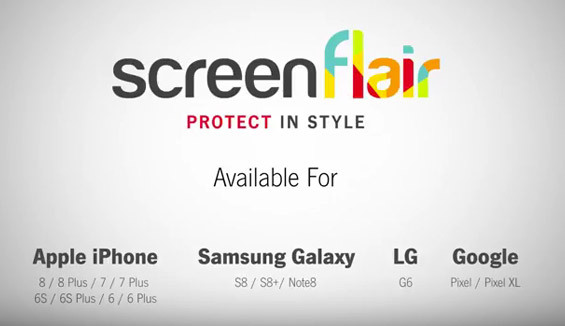 Screenflair provides multi-layer protection to prevent scratches, smudges and everyday wear and tear to the front of the device. They’re completely changeable and reusable. We were excited by this amazing new product, and couldn’t wait to help begin to build this new brand. One of the foundational elements of any new brand is the logo and color palette. Our design team hit it out of the park with the Screenflair logo – it’s vibrant, bold and distinctive, just like the product. The multi-colored look of “flair” in the logo is a fun way to tell the world that this is a product that’s got style. Enamore Products has the capabilities to make wonderful designs come to life on your phone – our design team, after researching and assessing current trends in fashion and culture, got to work on coming up with different categories and designs. After numerous focus groups, over 200 different designs were approved, in categories such as style, travel, arts & entertainment, sports, animals, food, patriotic, just for fun, inspirational and holidays. The HS Web Development team began creating an e-commerce site for Screenflair – we also developed packaging, an instruction/tips card and a custom cleaning cloth that would come in each package. All of these elements were branded with the bold Screenflair signature style. While Screenflair is only available online for now, it could eventually be sold in retail stores. HS was able to facilitate a discussion with one national retailer already about carrying this product. Our digital strategists began formulating a plan for an introductory campaign. We set up all relevant social media channels and customized content for each platform, including gamification concepts and several distinctive HTML5 rich media ads to increase impressions and engagement. The HenkinSchultz video production team created a product video that highlighted the key features of this new screen protector and served as a great introductory piece to the market. HS also created an instructional video that explained the application process in a fun, engaging way. We also created a video featuring tips on how to get the most out of your Screenflair experience. It’s been exciting working with Enamore Products and their manufacturing and development team and we look forward to rolling out this introductory holiday campaign over the coming months. 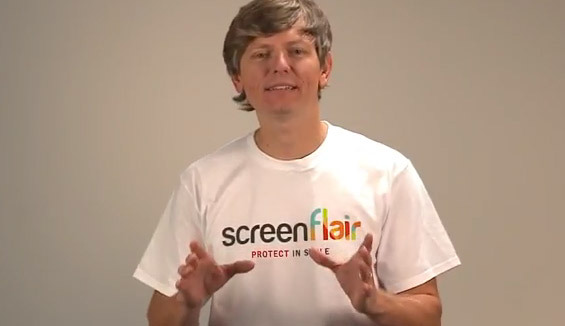 Check out screenflair.com for more on these cool new screen protectors.